But my cookies aren’t flat anymore! These will be on the blog this weeeeeek! And they’re SO GOOD. I had so much boring, not fun stuff going on this week but we did go to the monthly food truck festival over in Temple. 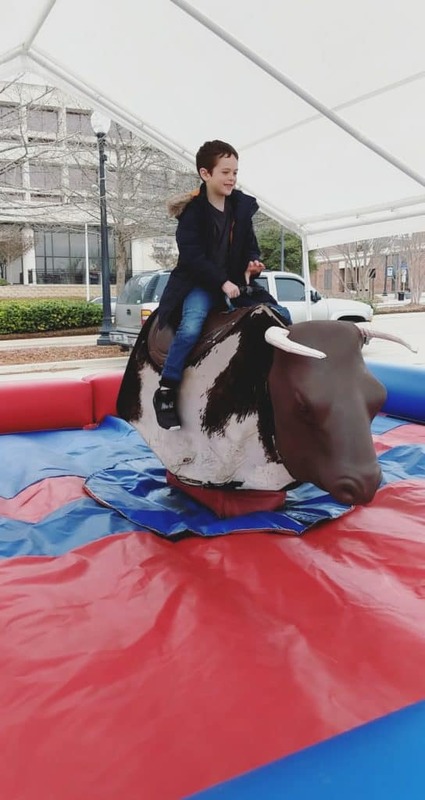 It’s was cold and rainy and kind of empty but that just meant no lines for food and my kids got to ride the mechanical bull over and over again. 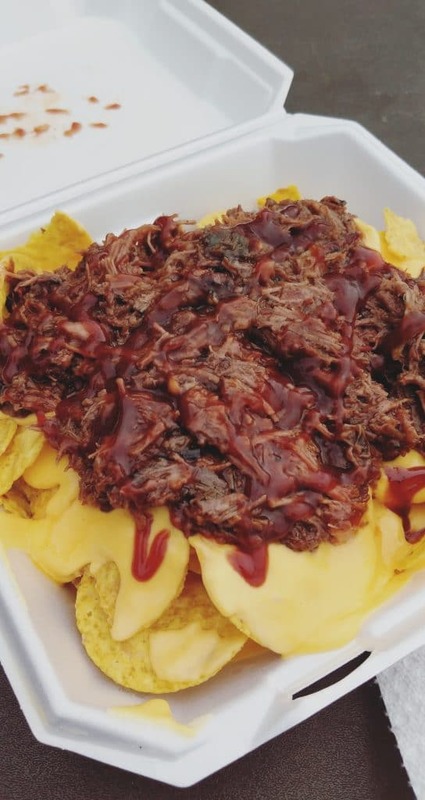 My food truck festival staple is the brisket nachos from Big Dog BBQ. They’re so good. They’re like those guilty pleasure movie theater nachos but covered in the most delicious smoky brisket. Y’all. So good. And I am predictable and cannot say no to Korean Kravings so oops, we had kimchi and bulgogi fries. Just a healthy day of fried stuff covered in cheese. The Good Doctor. You guys, why did no one tell me how good it is?! I’m only 3 episodes in and I’m so emotionally invested. And no, I don’t watch This Is Us. We will continue to use our crockpot. This spread. I got the bombay one (found it at Natural Grocers) and have been putting it on rice cakes with thai chili tuna on top and it’s so good. Also delicious on avocado toast. The Daylio app. It’s a really simple journaling app where you pick a face that describes your day and then can leave notes about what you did or whatnot. I’ve been a journaler since I was very small but find that I really don’t have time for it these days. This app is perfect for me. It also has a chart so you can really see how your mood fluxuated over the month or whatever. I’m in love with this collagen beauty water and I swear I see a difference in my skin if I skip it for a few days. I have the strawberry lemon one right now just add it to a giant bottle of water first thing in the morning. Favorite podcast of the week were both Maya Angelou episodes of Oprah’s podcast. Just listening to the 2 of them talk is relaxing and you can feel how much they love and appreciate and inspire each other as they have the conversation. Go listen now. Also, the How To Handle Information Overwhelm (and Social Media) episode of The Tim Ferris Show changed my life. I don’t know how it even ended up in my downloaded list but I kind of just needed to hear it this week. 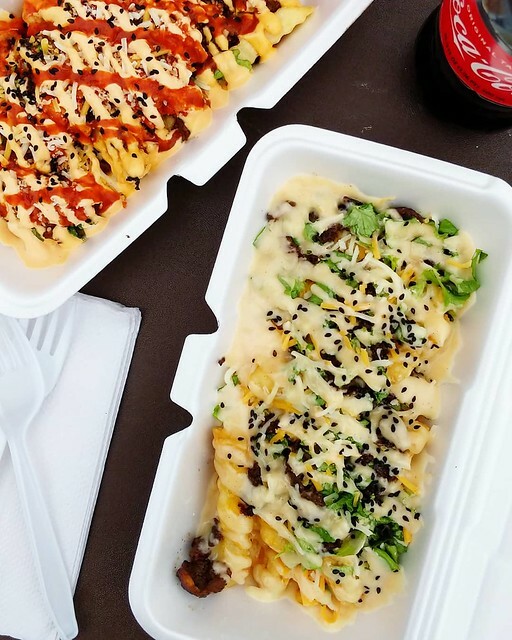 Favorite thing I ate all week were the fries from Korean Kravings (below). Obviously. Okay! 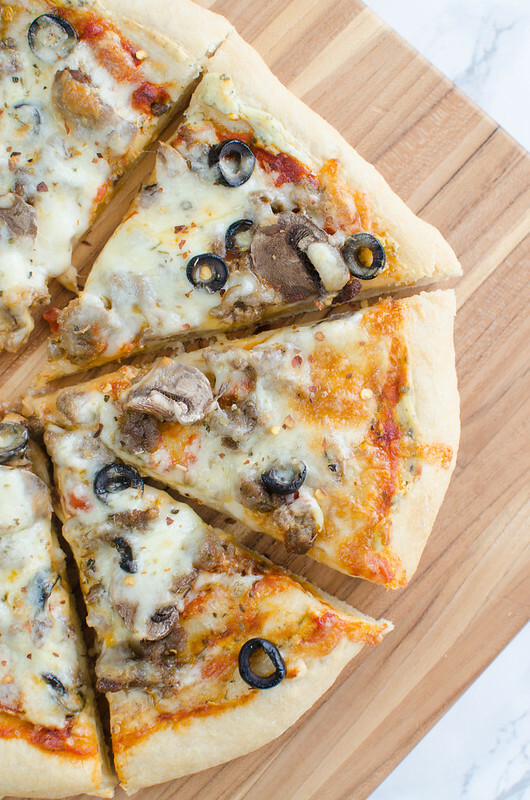 Pesto Sausage Pizza with Mushrooms and Olives! I had a random pesto pasta recipe in one of my Hello Fresh boxes a few months ago and I’ve never really been a huge pesto person but it got me hooked and now I have pesto in my fridge at all times. It’s seriously the easiest way to add a ton of flavor to things when you’re lazy but don’t want bland boring food. Which is me every day of my life. Anyway, so for this recipe I wanted a creamy pesto sauce with some red sauce on top and then I layered cooked sausage, mushrooms, and sliced black olives. Topped it all the monterey jack cheese and then baked it in my stupid gas-smelling oven on the pizza stone until it was golden and crisp on the bottom. Preheat oven to 500F with pizza stone in oven. Let sit for 15 minutes after preheated. Use a fork to combine the softened cream cheese and pesto. Spread over the prepared dough, leaving about an inch around for the crust. Spread the red sauce on top. 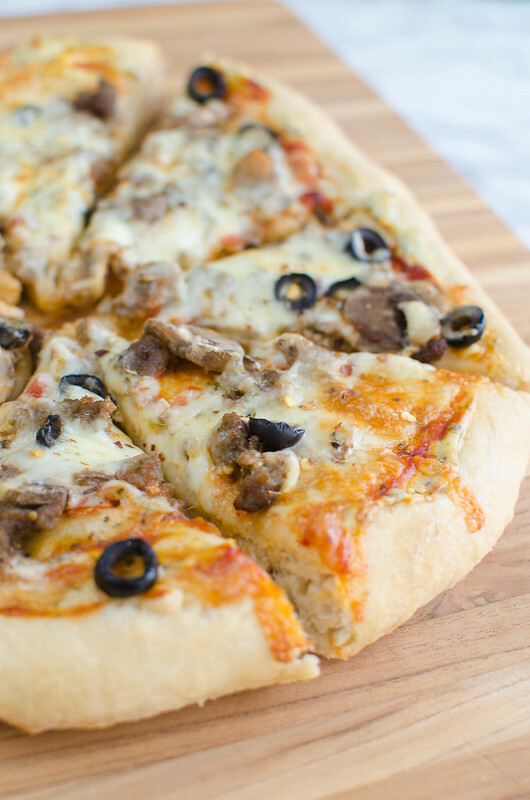 Layer the sausage, mushrooms, and olives on top. Sprinkle with the cheese and Italian seasoning. Brush the crust with a tiny bit of olive oil and transfer the pizza to the oven. Bake 12 - 14 minutes or until crust is golden brown and the cheese is just beginning to brown in spots. Sprinkle with crushed red pepper flakes before slicing and serving. 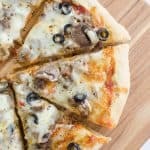 2 Responses to "52 Pizzas – Pesto Sausage Pizza with Mushrooms and Olives"
You have my sympathies. 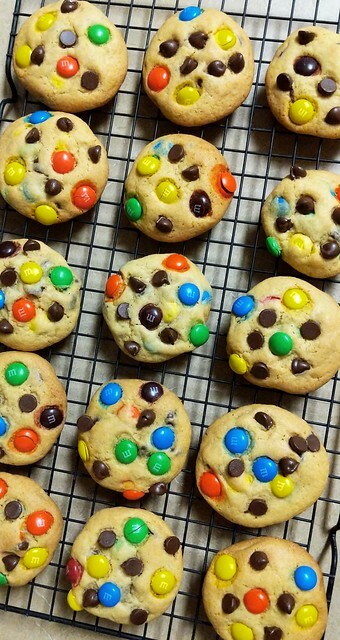 Ovens always stop working when you are baking something in them. The pizza looks delicious!! I must now try it. We love The Good Doctor also. I could not get into This is Us, there was too much back and forth for me.